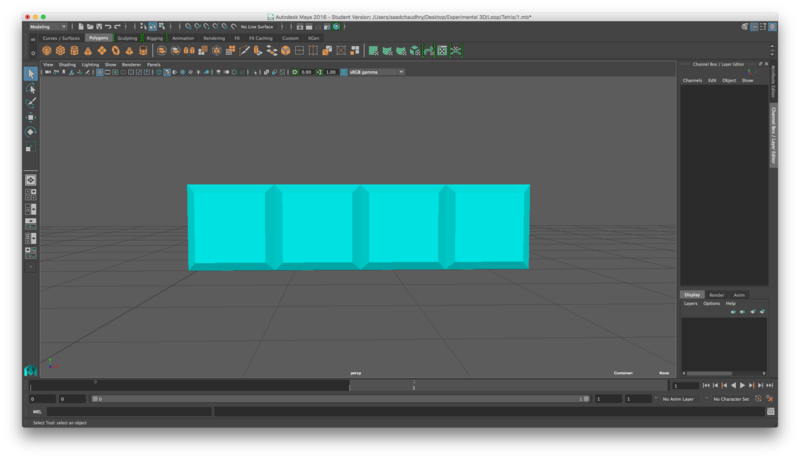 This entry was posted in Experimental 3D on January 18, 2016 by saadchaudhryme. 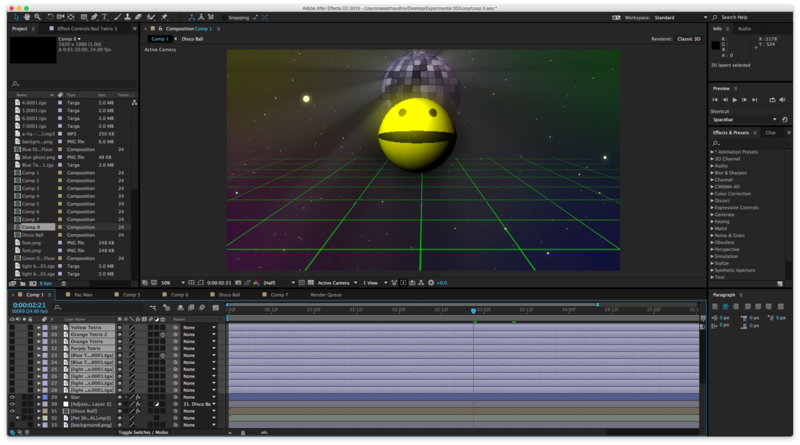 This is my final video loop for 7 seconds. 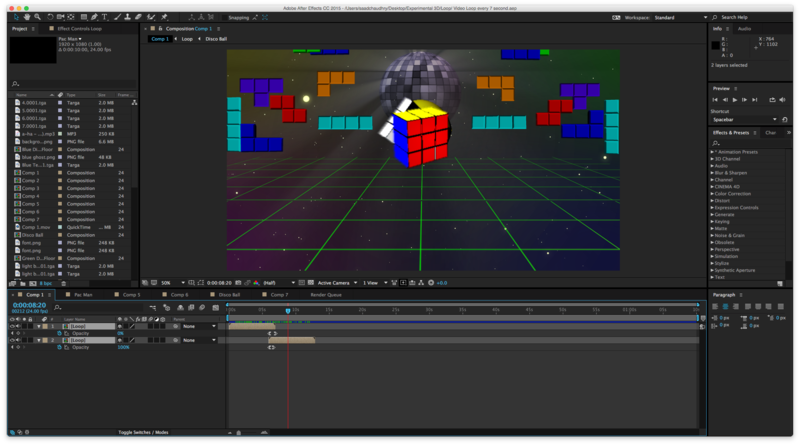 I tried looping my video with the loop button in quicktime. 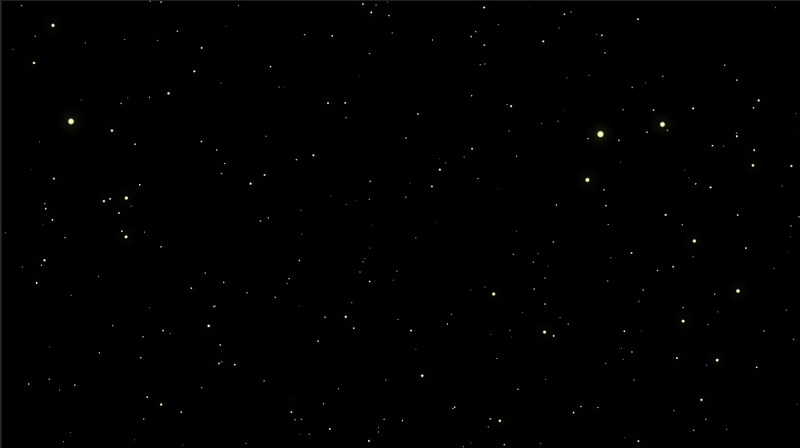 This though made my video have a slight jump when it would start again. 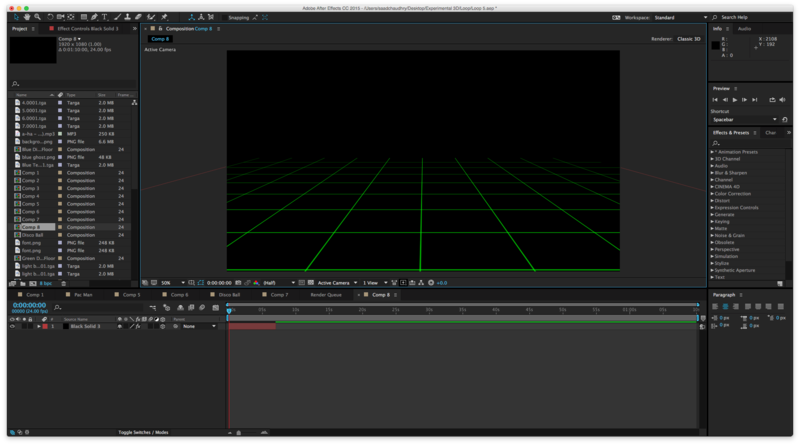 It was not a seamless loop like it should be. 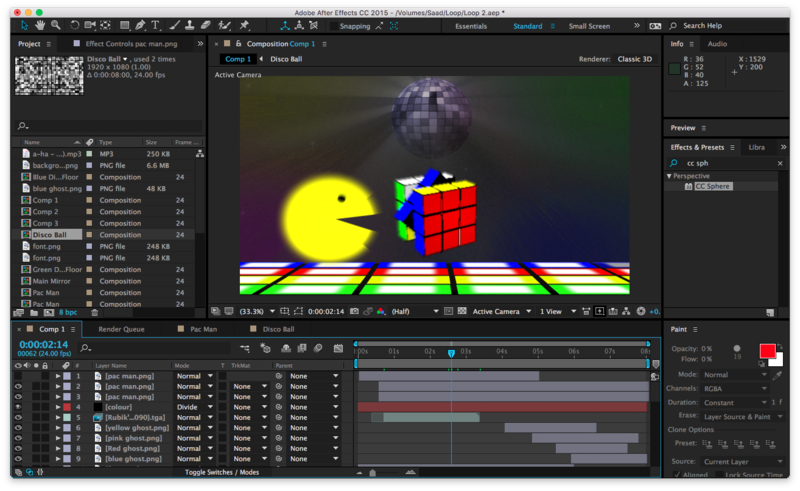 I found this tutorial and tried looping my video again. 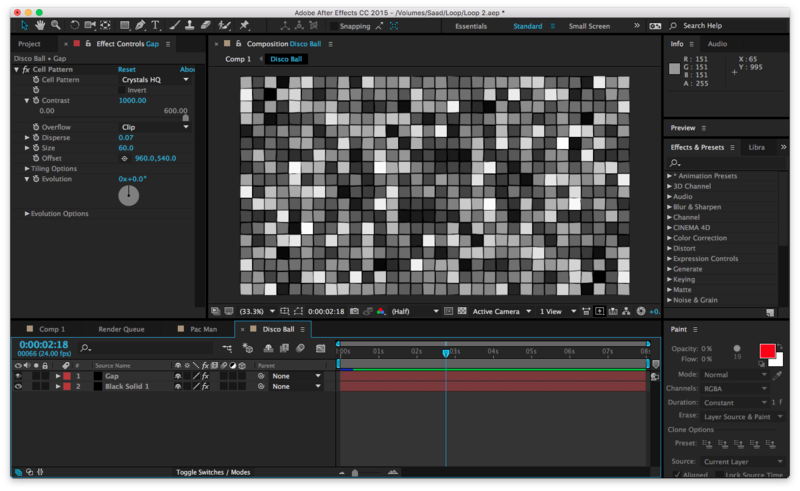 It was better but took an hour or so just to get it to loop a couple of times because I have to cut and paste each timeframe at exactly the right point. 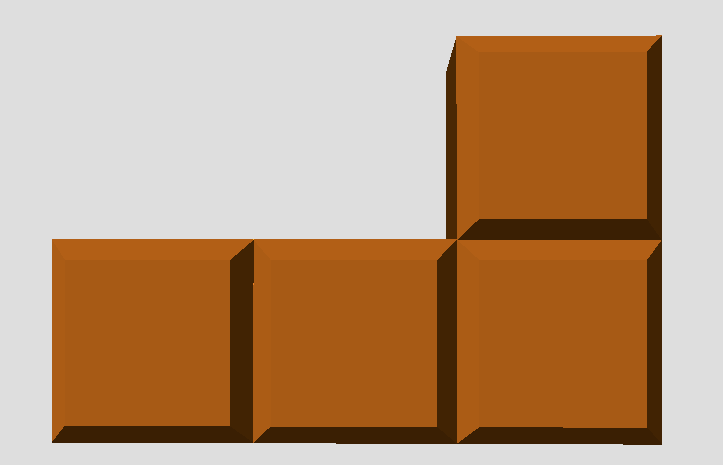 After feedback from Harris I felt I needed to improve my idea. 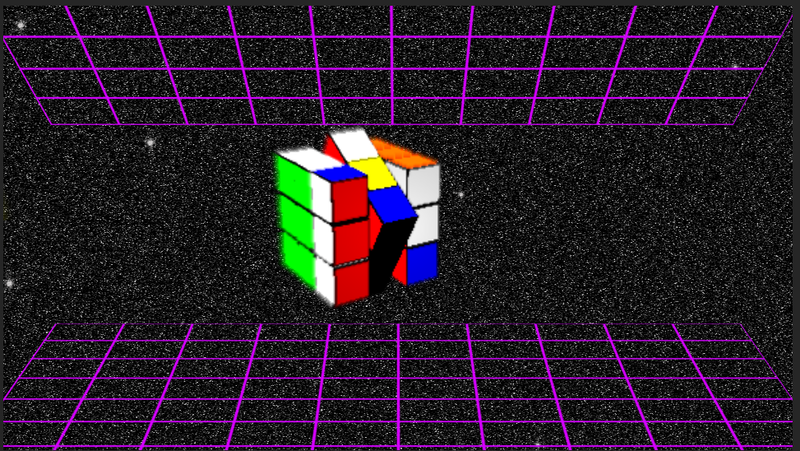 He said it needed more 3D images. 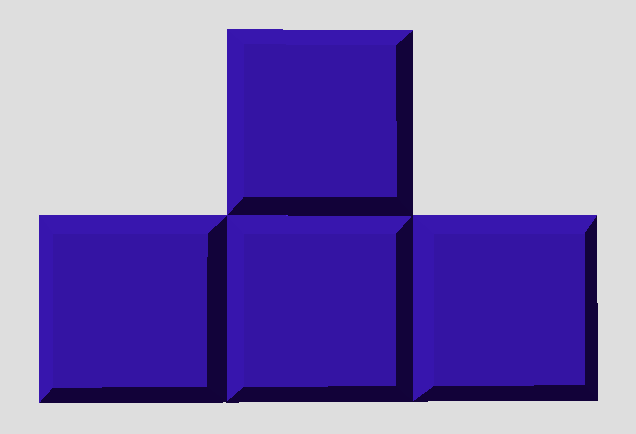 After more research I found that Tetris was also a very popular game so decided to add this in and Haris suggested it would be a good idea to have them explode. 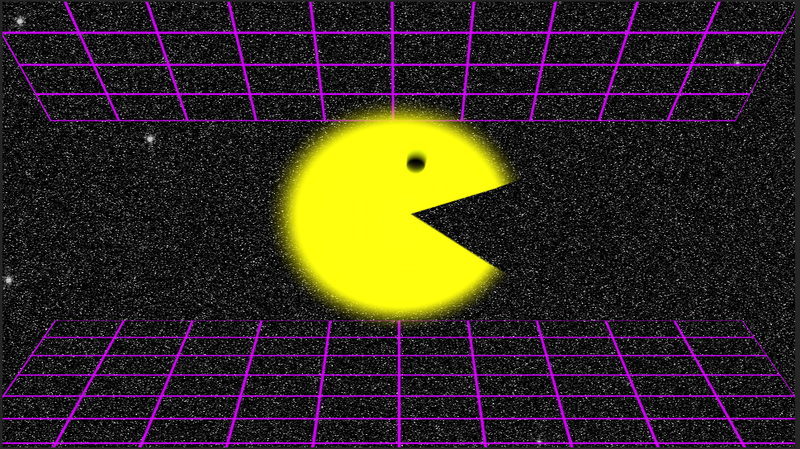 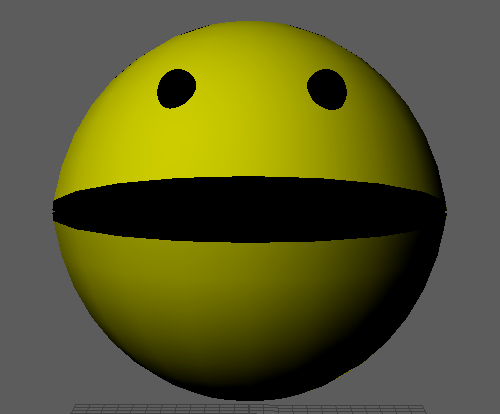 I also decided to create Pac man in 3D.Was not sure if it would work but having him move towards you rather than coming from the side seemed to work quite well. 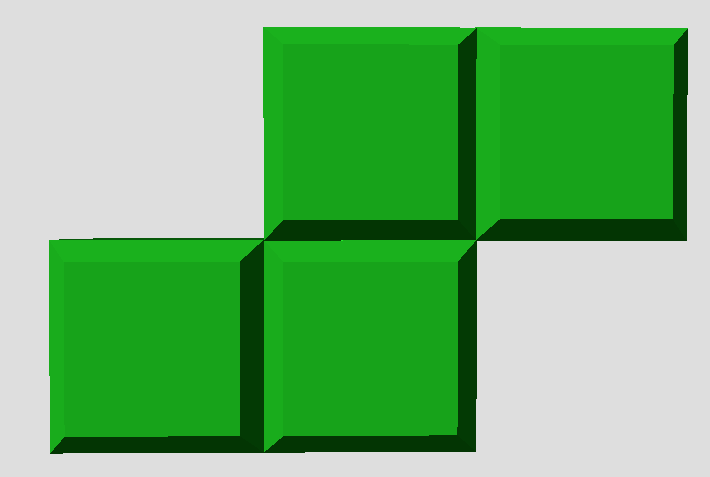 I researched how to get the grid to scroll as I felt a moving grid would look better. 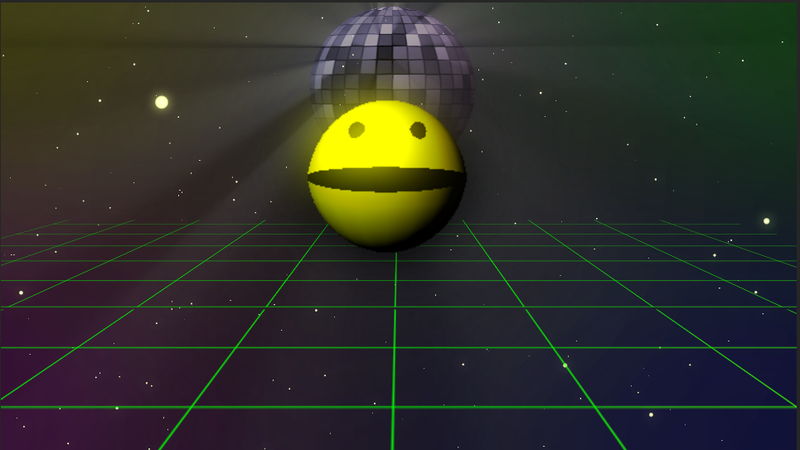 I completed the video with a starry background to complete the disco look. 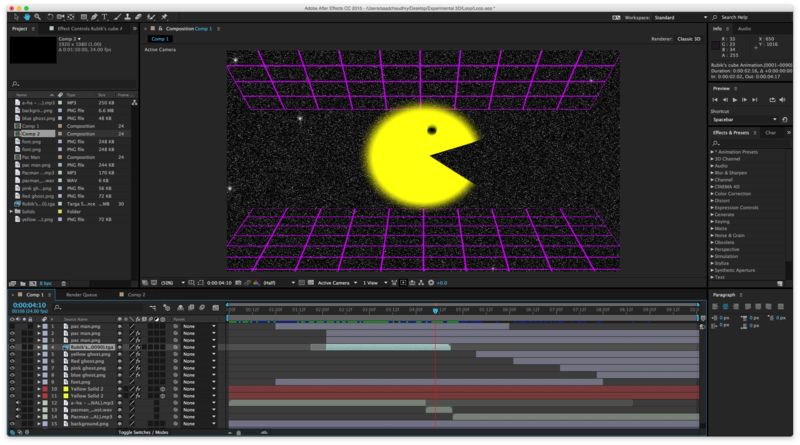 I also decided that I would explode Pac man as I thought it would fill the screen better and would complete the ending of the loop. 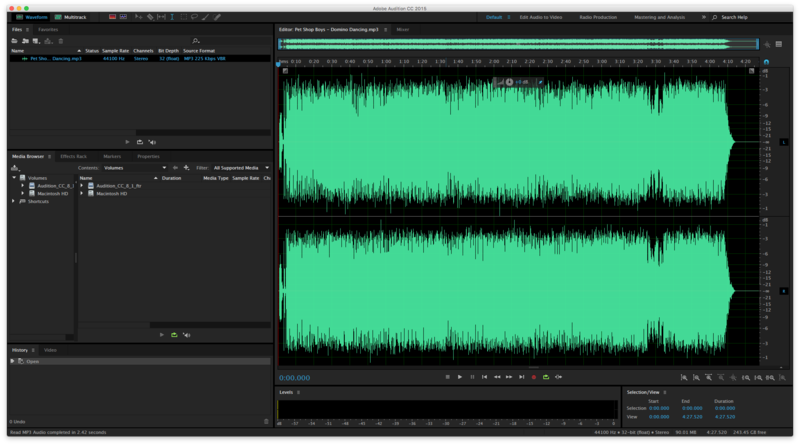 I converted the music into Mp3 from youtube converter and then uploaded into Adobe Auditions editing the part that I wanted. 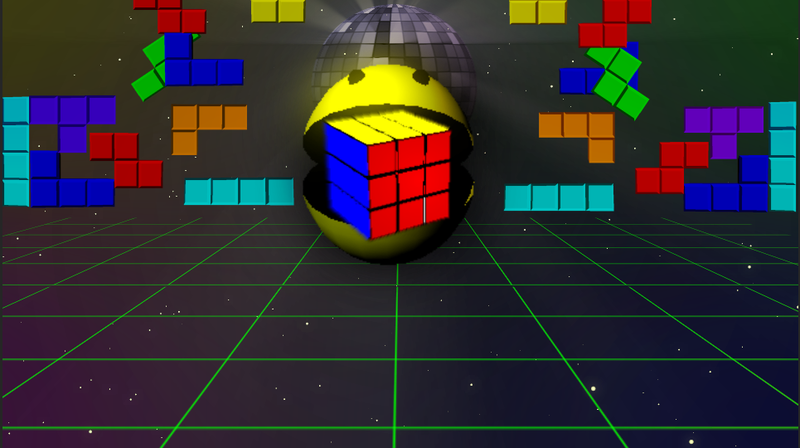 Here is the final video. 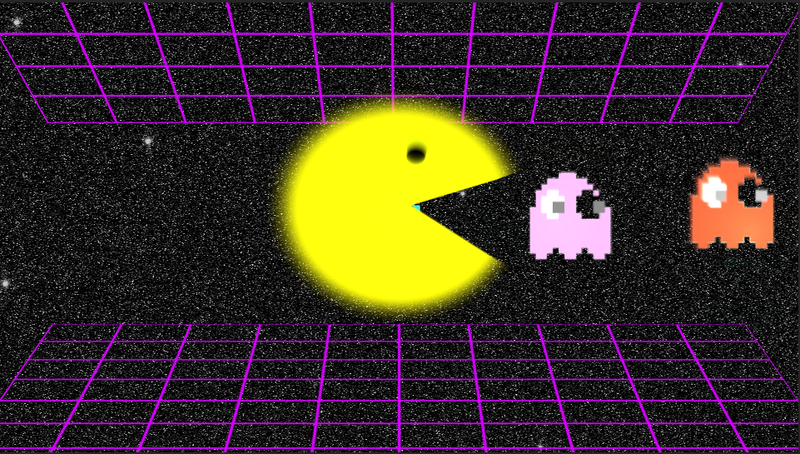 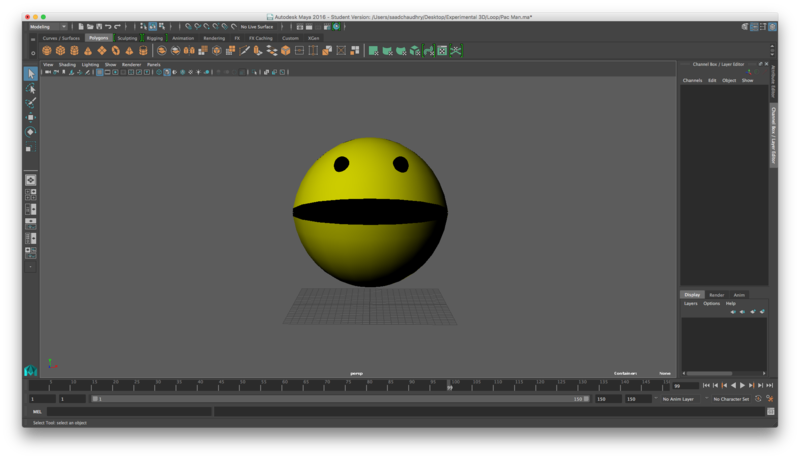 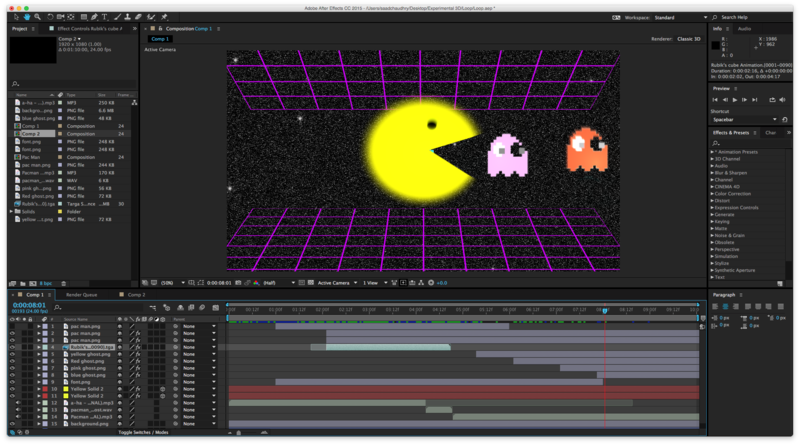 After creating a 2D Pacman I decided to make 3d Pac man model in maya. 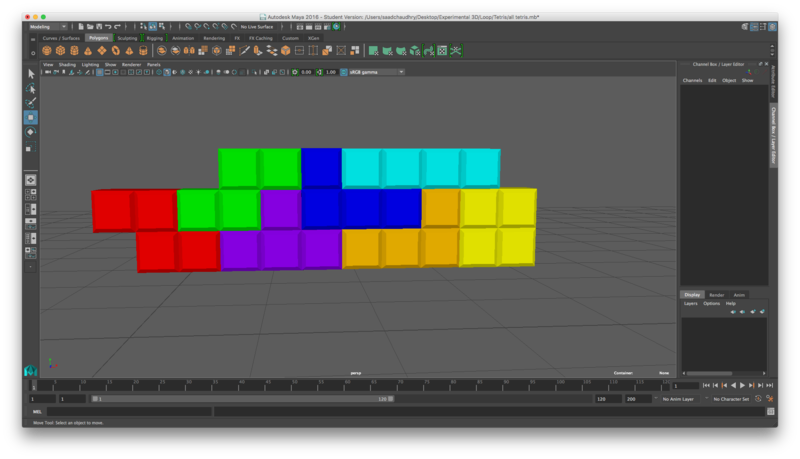 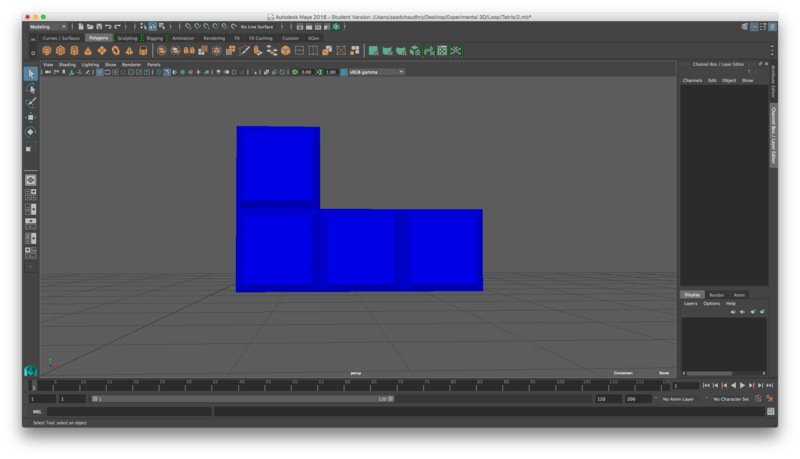 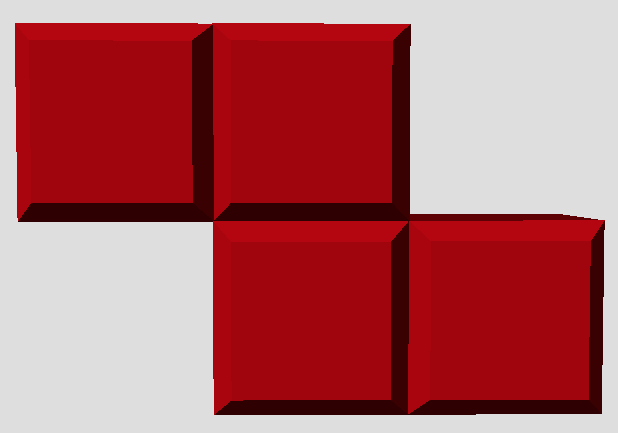 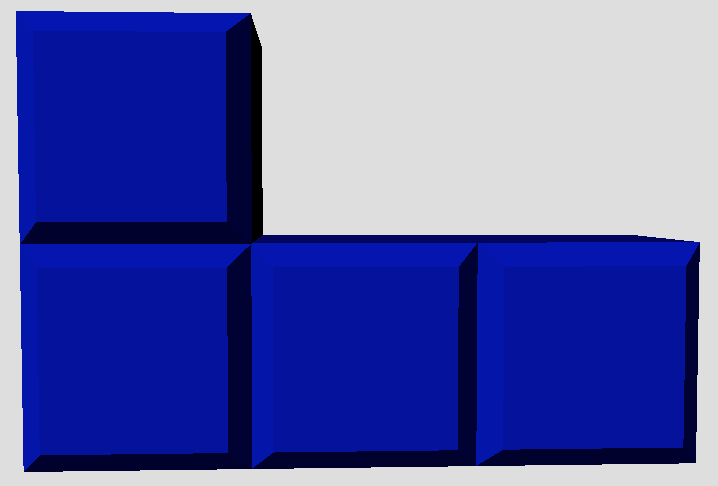 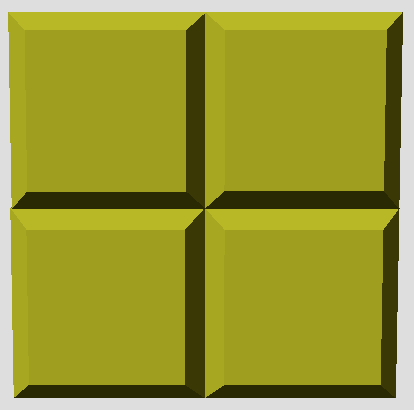 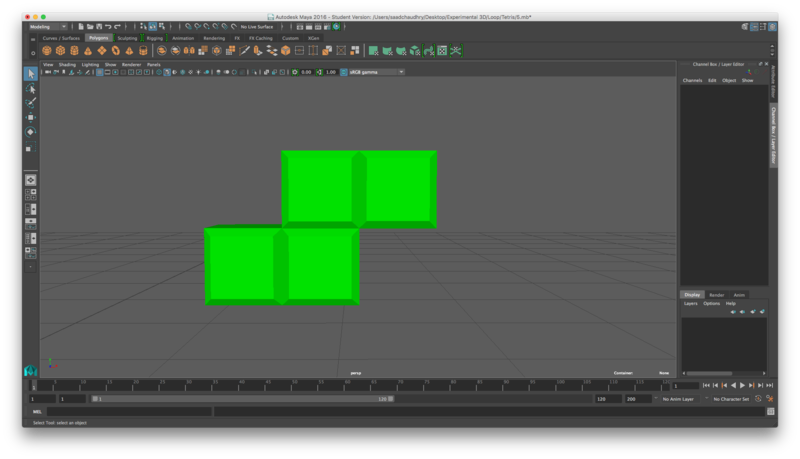 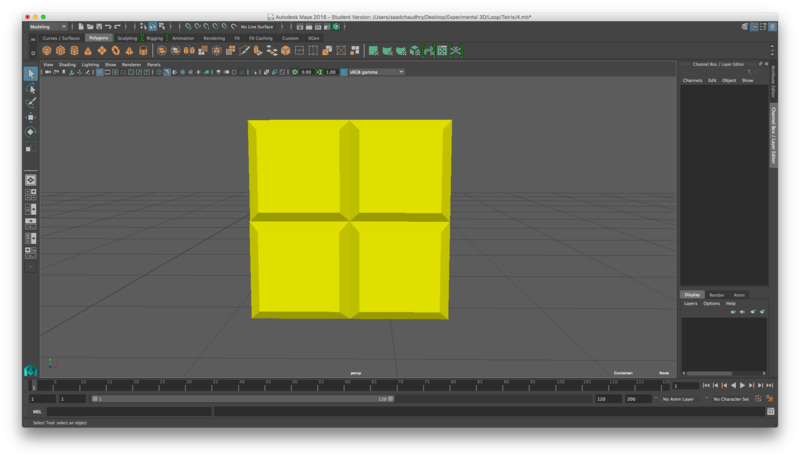 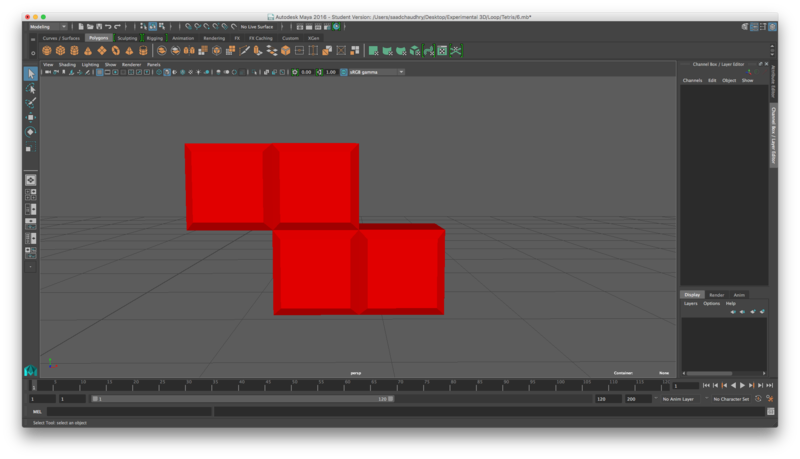 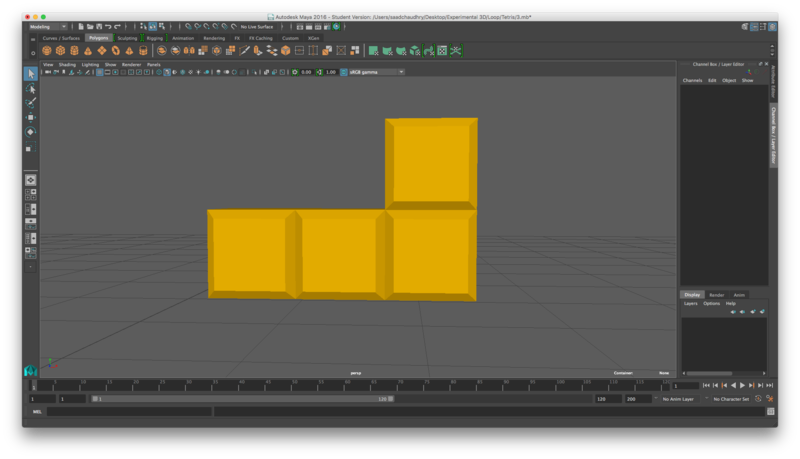 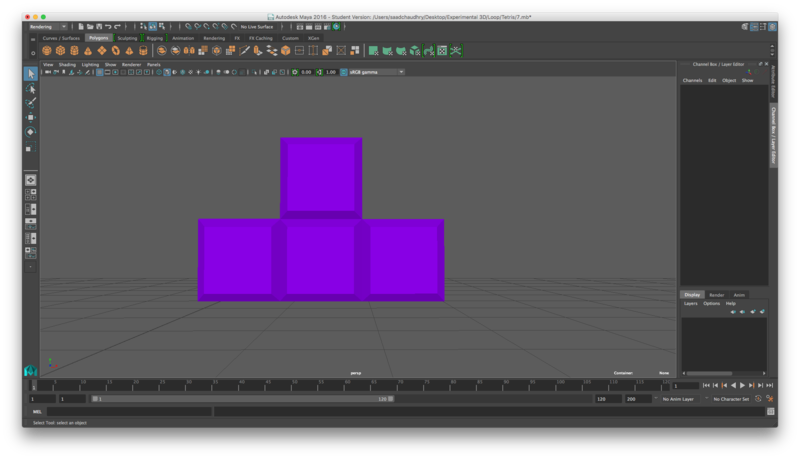 I created 7 different types of 3D Tetris in maya. 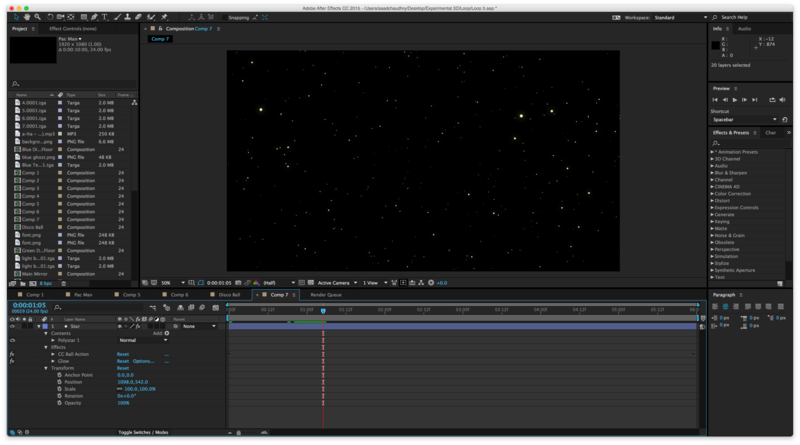 After then uploading into After Effect. 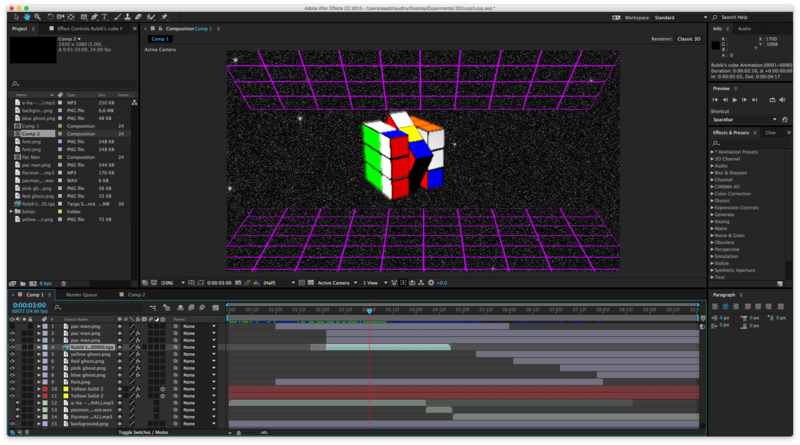 After creating my original video loop I reviewed the video and felt it could be improved on. 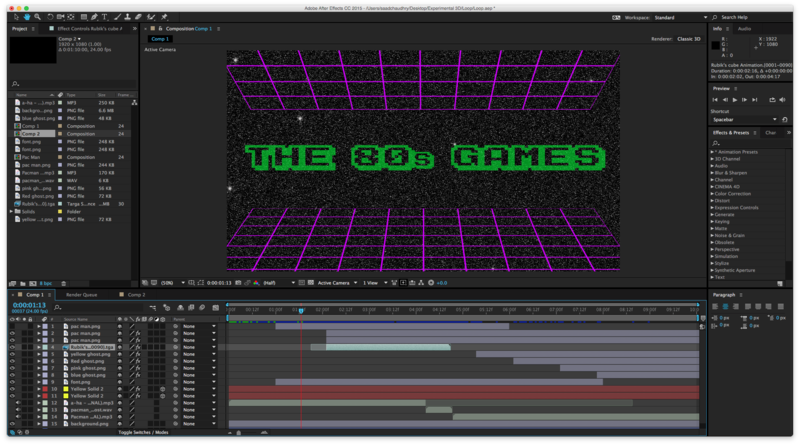 It needed to have more 3D elements and I also wanted it to have a more of a 1980s feel. 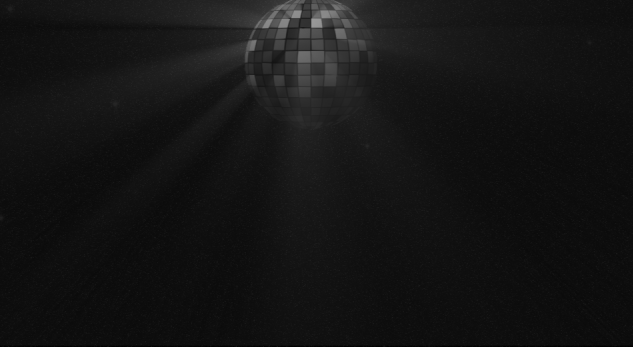 After more research and asking questions from family who remembered the 80s I found out that it was an era very popular for discos, colour and everything bigger and bolder. 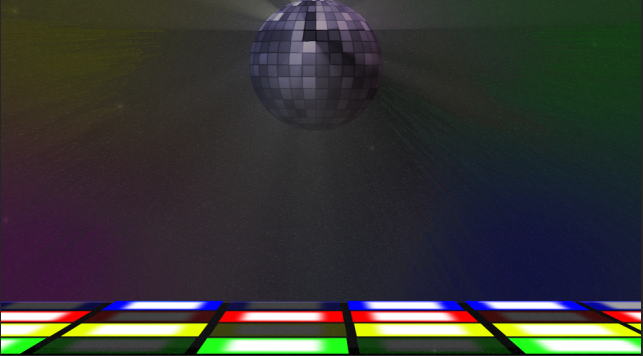 I decided to add a disco ball and dance floor to my video and took out the grid which was in my original video. 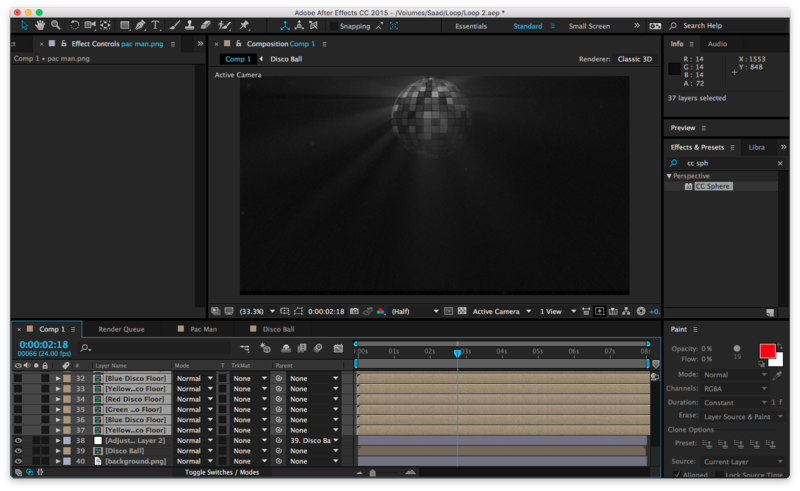 I created the ball in after effects using a cell pattern and turning it into a cc sphere. 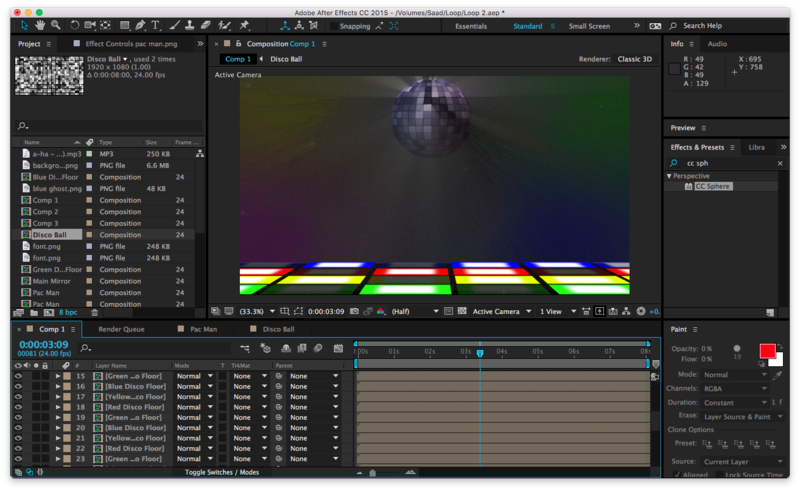 I used the adjustment layer to get the flashing lights on the ball. 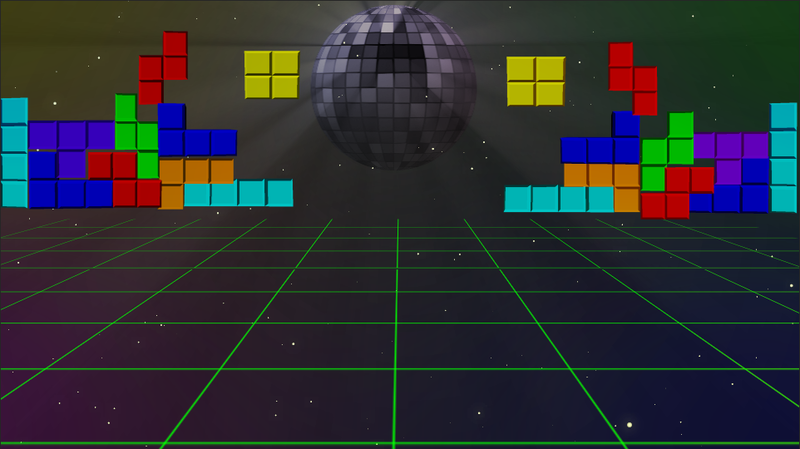 I created the dancefloor using the rectangle tool. 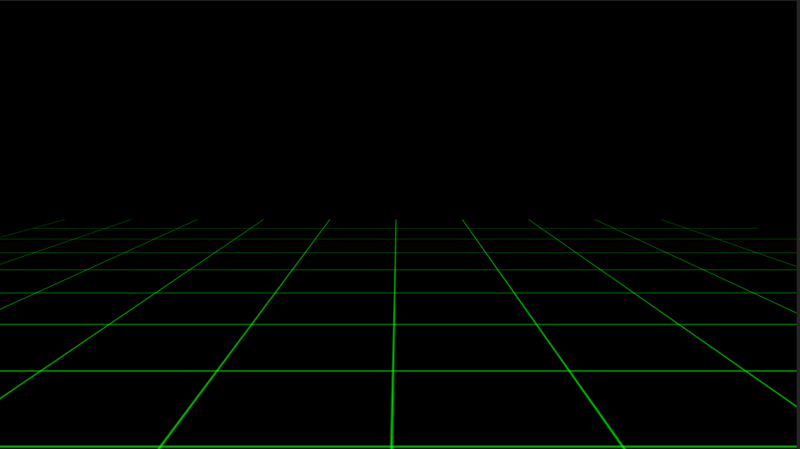 This is my first attempt at creating the video loop. 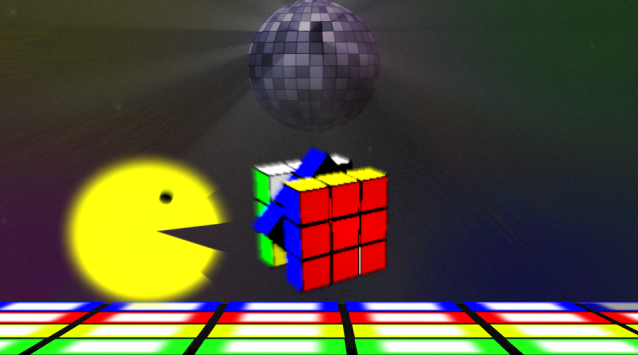 After research I found that the rubiks cube and pac man were extremely popular in this era and are still remembered and played today. 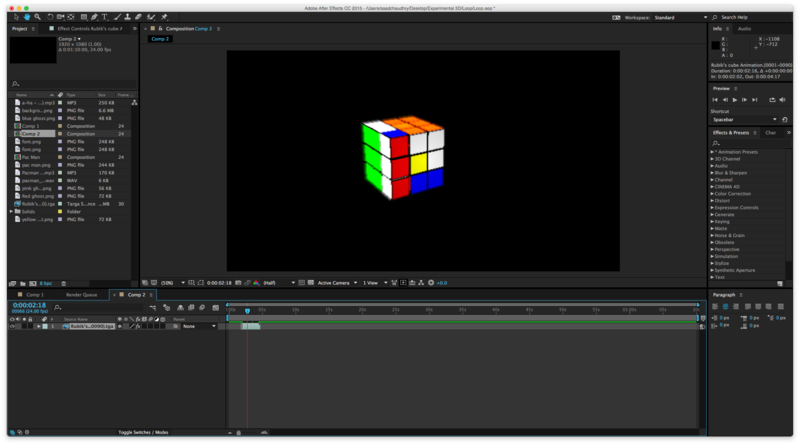 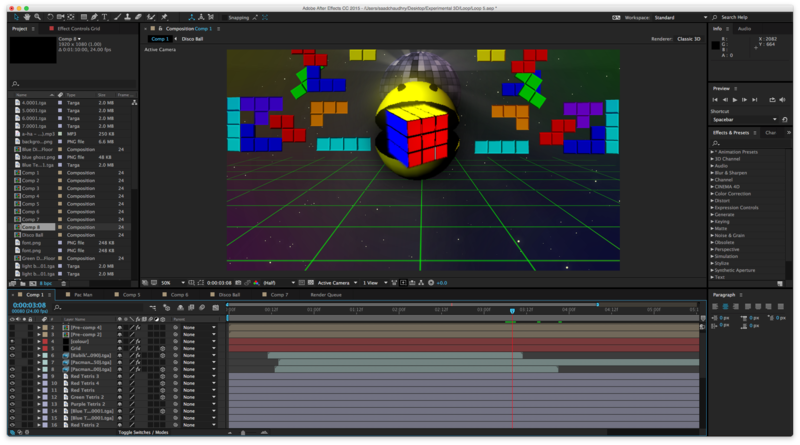 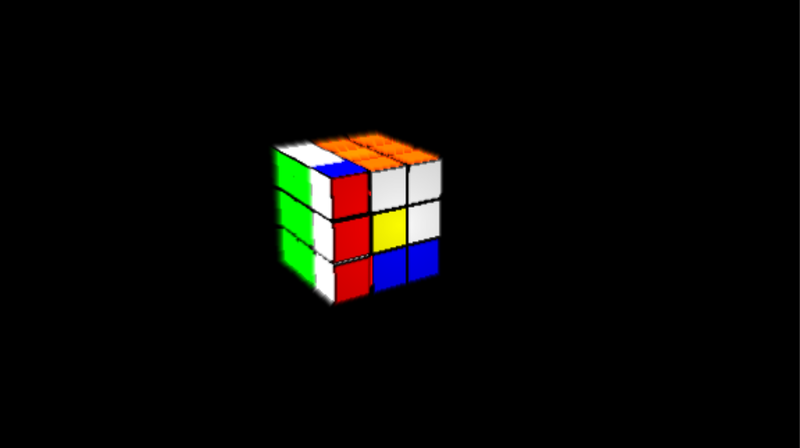 Rubiks cube was created in maya and uploaded into aftereffects. 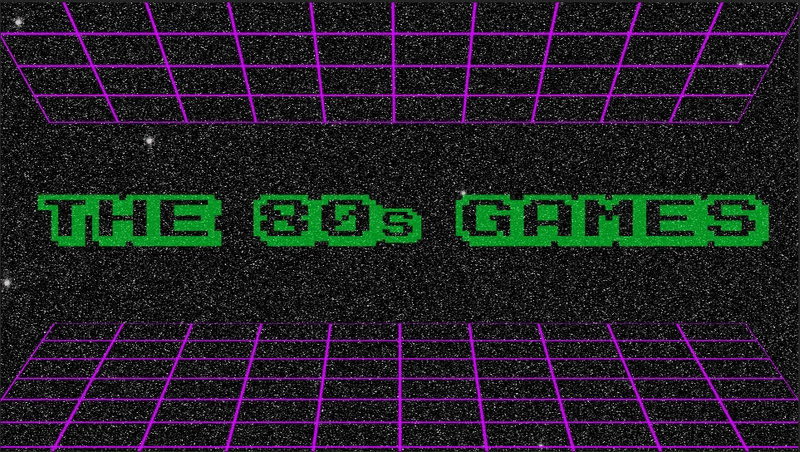 I found that a grid was popular in the images of the 1980s so decided to add this but didn’t know how to scroll it but it does give the loop a retro futurism feel. 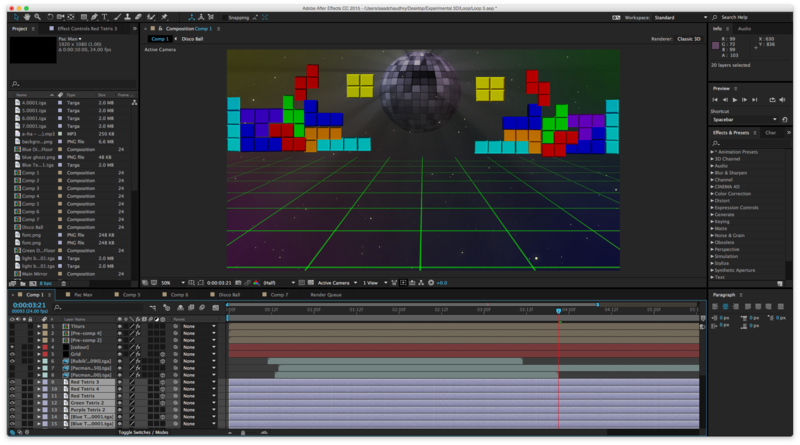 These images show how the scene would look like after adding the images together.